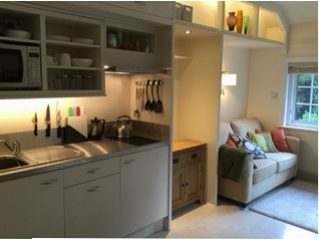 "...with the help of John Strand we got exactly what we wanted"
John Strand kitchens are small, practical and affordable. These qualities make them a popular choice for contractors and large scale developments. We know that small kitchens are required for many different uses beyond the trade contracts we regularly deliver on and so we are proud to be able sell our products online and work directly with clients when they need a kitchen but the standard ‘off-the-peg” selection just doesn’t fit the bill. We recently had the pleasure of working with just such a client. 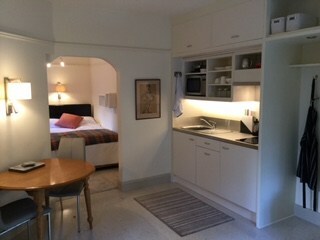 Helen is private home owner and has undertaken a conversion from an existing en-suite set up which comprised of an interconnecting bedroom, study and bathroom/toilet, to make a self-contained independent living space. The new space required acoustic insulation from the rest of the house, with its own separate exterior staircase and entrance. The project needed to be completed within 12 months and part of the design required a new kitchen. The finished product is a stylish bespoke kitchenette. The kitchen boasts soft close matt cream coloured doors, stainless steel worktop and upstands, combination microwave oven, LED counter lighting, ducted extractor, refrigerator and induction hob, all in a space under 1800mm wide. Helen’s clever use of built in storage and tasteful soft furnishings in a neutral palette has resulted in cohesive space with a real sense of flow that looks fantastic.